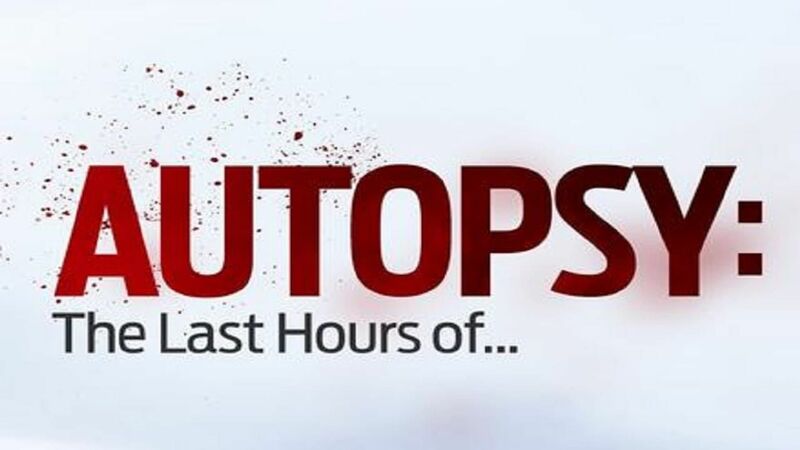 Here's where to watch every episode of Autopsy: The Last Hours of... season 5. Mouseover or tap an episode to see where to stream it. Click or tap the play icon to stream it on the best available service. John Belushi Mar 5, 2016 John Belushi was a comedy genius. The gross-out characters he created in Animal House and Blues Brothers were iconic. After a meteoric rise to stardom, 33 year-old he was on the cusp of super stardom. But on March 5th, 1982 he was found dead died in Hollywood’s Chateau Marmont Hotel. Using information revealed in John Belushi’s autopsy report, Dr. Michael Hunter investigates his final days and hours to reveal the cause of his death. Jimi Hendrix Mar 12, 2016 Jimi Hendrix was one of the highest paid musicians in the world. At the age of 27 he had made 3 multi-million albums and had set the gold standard in rock music electric guitar. But he died in London on the September 18, 1970. The coroner concluded that he died after breathing in his own vomit. But, stating insufficient evidence of the circumstances surrounding his death, he returned an open verdict. Nearly half a century later, his death is still shrouded in mystery. Numerous conflicting accounts of his final hours have obscured the truth and fueled conspiracy theories about drugs overdose, suicide and murder. Now Medical Examiner Dr. Michael Hunter re-examines Hendrix’s death to cut through claim and counter claims and, using the medical evidence, determines precisely how he died. Maurice Gibb Mar 19, 2016 Maurice Gibb was one third of global mega band, The Bee Gees. In a career spanning four decades, they sold over 220 million records. They were best known for their disco classics, high pitched singing voices, and boufant hairstyles. Whilst his brothers sang lead vocals, Maurice was the hidden talent that held the band together, considered by insiders to be the musical director. But on Wednesday January 8th, 2003, Maurice Gibb collapsed in agony at his Miami home. He died 4 days later, aged just 53. According to witnesses Maurice Gibb’s death came out of nowhere. So why Maurice went from healthy to collapse to death in 4 days is a mystery. Now forensic examiner Dr. Michael Hunter investigates the forensic evidence. Notorious B.I.G. Mar 26, 2016 The Notorious B.I.G., rapped about girls, guns and money. His rhyming skills and flow propelled him to worldwide fame. A larger than life figure from Brooklyn, New York, his raw talent lifted him from the streets. But in the early hours of March 9th 1997 The Notorious BIG was gunned down in a drive by shooting in downtown Los Angeles. For decades, police have hunted for his killer, but still no-one has been brought to trial. Using information revealed in his autopsy report and police files, Dr. Michael Hunter investigates a motive for BIG’s murder and the identity of his killer. Don Cornelius Apr 2, 2016 Don Cornelius was the legendary creator of the hit music and dance show, Soul Train. The “Godfather of Cool,” he took black music mainstream, provided the first national exposure on American TV for black musicians and dancers and redefined music, dance and fashion for generations. But on February 1st 2012 Don Cornelius was found shot dead at his home in Los Angeles. The LA County Coroner called it a suicide. Now, Medical Examiner Dr. Michael Hunter is taking a fresh look at the death of an icon who inspired generations. Liberace Apr 9, 2016 Liberace was one of the most charismatic performers of his generation. His meteoric rise to fame in the 1950s made him the highest paid entertainer in the world. His dazzling stage shows and outlandish costumes earned him a vast international following. But on February 4th, 1987, Liberace was pronounced dead at his home in Palm Springs, California. However, the circumstances surrounding the death of one of the world’s most popular entertainers are shrouded in mystery. Liberace’s doctor had signed a death certificate, giving the cause of death as cardiac arrest. But the coroner wasn’t satisfied. He suspected foul play, and two days later, ordered the body to be taken from the mortuary and subject to autopsy, while millions of fans around the world were still in mourning. So what exactly killed Liberace? Dr Jason Payne James examines the case. Bobbi Kristina Brown Jul 19, 2016 Dr Jason Payne-James re-examines the medical facts surrounding the death of the daughter of Whitney Houston and Bobby Brown. Chris Farley Nov 19, 2016 Chris Farley was the larger-than-life Hollywood star regarded as one of the funniest comedians of his generation. His outrageous blend of physical slapstick and vulnerable charm earned him the adoration of the American public. After shooting to fame in the early 90’s as one of Saturday Night Live’s brightest talents, he went on to star in a string of hit movies. But on December 18th 1997 Chris’ body was found on the floor of his Chicago apartment, after four days of partying. He died alone aged 33. Now, Medical Examiner Dr. Michael Hunter is taking a fresh look at the death of an icon who was loved by millions. Corey Haim Nov 26, 2016 Corey Haim was the poster boy of 1980’s Hollywood, starring in “The Lost Boys”, “Lucas”, and “License to Drive.” Forensic Pathologist Dr. Michael Hunter examines Corey’s autopsy report to dispel the rumors, and reveal the real cause of the actor’s tragic and untimely death at the age of 38. Cory Monteith Dec 3, 2016 Cory Monteith was a global superstar. The clean cut all American quarterback on Glee idolized by millions of teens around the world. The TV phenomenon thrust him to instant stardom in 2009 and his public persona mirrored his on screen character. But on 13 July 2013 he was found dead on his hotel room floor, aged only 31. Forensic Pathologist, Michael Hunter, discovers that Cory was not what he appeared and beneath his clean cut exterior lay a dark and troubled past that would come back to haunt him. Casey Kasem Dec 10, 2016 Radio legend Casey Kasem passed age 82 in June 2014. He had severe dementia. But when his daughters visited him a Santa Monica convalescent hospital five weeks before his death his medical records show there was nothing to suggest his imminent demise. That night his wife removed him from the facility against medical advice. World-renowned forensic pathologist Dr.Michael Hunter investigates the tragic events leading up to his death to determine precisely how and why he died.